Confirming our report last week, Facebook has just announced a major new feature that it’s launching in tandem with Skype: video calling. You’ll also see video calling integrated into Facebook’s Chat product. Really, you can’t miss it — Facebook is launching a new chat sidebar today that by default it takes the entire right side of the screen, and the first time you click on any user you’ll see a prompt asking if you’d like to make your first video call. If you try to initiate a video call and the other user doesn’t respond, you’ll be prompted to send them a video message. Update: Facebook engineer Philip Su has just published some notes on how the team built the feature. To make installation as easy as possible, we specifically customized the installation flow for each OS and browser combination. For instance, on Mac browsers with Java enabled, the installer is hosted entirely within the browser so that no additional clicks are required. We use a small bootstrap EXE in Windows browsers to minimize the initial download time and to manage installation permissions as seamlessly as possible. We also put the entire installation flow inline with the feature itself, instead of requiring a separate download and installation page, so that your call automatically continues once installation completes. 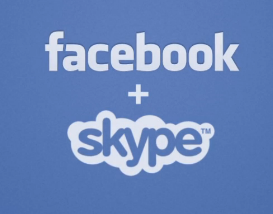 Also very cool: Facebook users are using Skype’s service anonymously. To ensure that you can make a call without needing a separate Skype account, Facebook connects to Skype’s secure REST APIs using encrypted user IDs to set up the necessary credentials. This opens up the possibility of video calling to users who might never have used Skype before, and makes the overall calling experience much simpler for everyone. While it would have been easier to give user IDs directly to Skype, we instead went to great lengths to make sure users are protected and anonymous on Skype’s service.